The 2007 SGS Convention and Show was held from August 1 to 3 at the Comfort Inn, Marietta, Ohio. We once again followed the usual schedule: Wednesday, Aug 1 - 1:00pm to 7:00pm, check-in, display set up, draw stampede numbers; 8:00pm Live and Silent Auction Preview; 8:00pm to 10:00 pm, Wine & Cheese Welcome Party; Thursday, Aug 2 - 9:00am to 11:00am, late arrival check-in and set up; 11:30am, Sales Stampede! 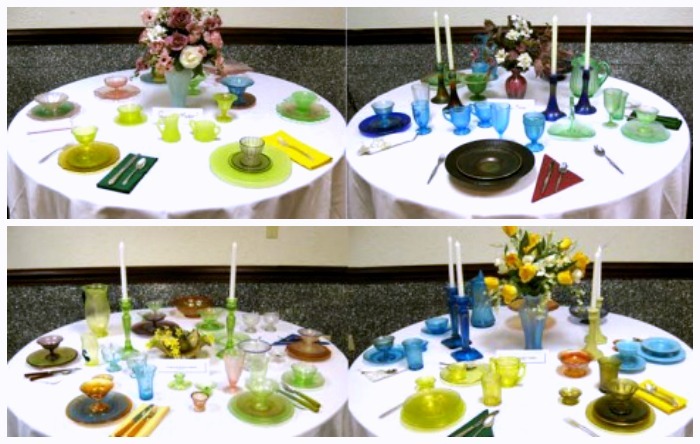 ; 1:00pm, Stretch Glass Identification Workshop with Dave Shetlar and 2:00pm, Club Display Review; 7:00pm, Buffet Banquet; 8:00pm, banquet speaker, Kelsey Murphy, glass cameo carving artist (Made in Heaven Studios, West Virginia); 9:00pm, Contemporary Stretch Glass Whimsey Auction; Friday, Aug 3 - 10:00am to 4:00pm, open to the general public; 12:00, SGS Members Annual Business Meeting and free box lunch; 2:00pm to 3:00pm, seminar by Shelly Fenton Ash, "Fenton Art Glass Company Continues Their 100th Anniversary Celebration - A Look at Fenton Glass Catalogs and QVC"; 4:00pm, Members' Contemporary Stretch Glass Raffle Drawing and Silent Auction Winners.